Add items to your Shopping List from your Favorites, or by adding new items directly to your Shopping List. As you shop, move items from your Shopping List to your Shopping Cart list. Before you pay, compare your Shopping Cart list with what is in your actual shopping cart to make sure you didn't forget anything. After you pay, empty your Shopping Cart list by using the toolbar button to clear its contents. Add your own new items to your Favorites, Shopping List, or both. 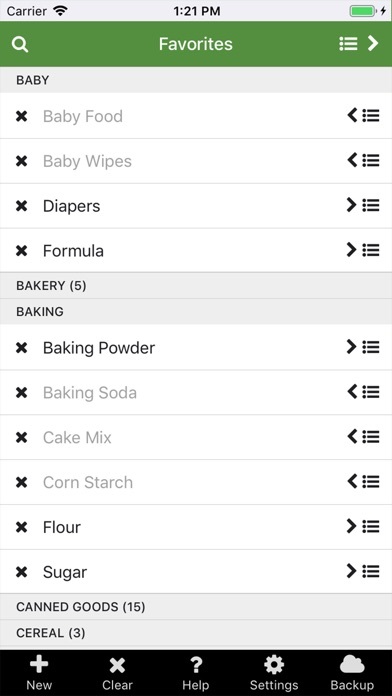 A default list of common grocery categories comes with the app, but you can add new categories and name them anything you like. Use the name of a store, or the name of a person. Save your customized lists and items by backing up to the cloud. Made too many changes? You can reset the items and lists to the default configuration when you first downloaded Shop List Go.